Interesting facts about Ants | Do You Know? 1. Ants are capable of carrying objects 50 times their own body weight. Relative to their size, their muscles are thicker than those of larger animals or even humans. This ratio enables them to produce more force and carry larger objects. We could lift up a Hyundai over our heads if we had muscles in proportions of ants ! 2. The legs of the ant are very strong so they can run very quickly. If a man could run as fast for his size as an ant can, he could run as fast as a racehorse. 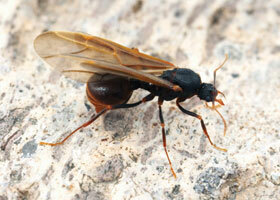 3.There are more than 12,000 species of ants which have been discovered and this number can increase in future. 4. Ants have two stomach, one to hold food for themselves, and second for others. 5.Ants are present in every continent except ANTarctica. How ironic is that ? 6. Certain ant species defend plants in exchange for food and shelter. Ant plants are plants with naturally occurring hollows where ants can take shelter or feed. In return,ants defend the plant from herbivorous mammals and insects, and may even prune away parasitic plants that attempt to grow on the host plant. 7. Most ants can survive 24 hours underwater. Ants don't have lungs, they breath through small holes found around their bodies, 'spiracles'. When an ant is drowned in a flood, it may appear to be dead. However, if the water can evaporate and there is enough oxygen flowing through these holes, the ant can miraculously comes back to life. 8. Soldier ants use their heads to plug the entrances to their nests and keep intruders from gaining access. In certain ant species, the soldier ants have modified heads, shaped to match the nest entrance. 9. Each ant colony has at least one or more queens. 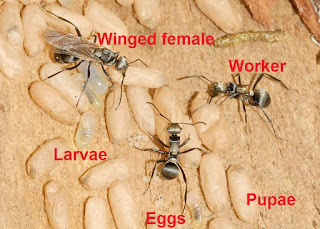 The job of the queen is to lay eggs which the worker ants look after. 10. If a worker ant has found a good source for food, it leaves a trail of scent so that the other ants in the colony can find the food. 11. At night the worker ants move the eggs and larvae deep into the nest to protect them from the cold. During the daytime, the worker ants move the eggs and larvae of the colony to the top of the nest so that they can be warmer. 12. The total biomass of all the ants on Earth is roughly equal to the total biomass of all the people on Earth or even more. 13. Ants will enslave other ants, keeping them captive and making them do work for the colony. Quite a few ant species will take captives from other ant species, forcing them to do chores for their own colony. Some honeypot ants will even enslave ants of the same species, taking individuals from foreign colonies to do their bidding. 14. Ants lived alongside the dinosaurs. Ants evolved some 130 million years ago on Earth. 15. Ants started farming long before humans. The earliest evidence suggests ants began farming as early as 70 million years ago. Even more amazing, these ants used sophisticated horticultural techniques to enhance their crop yields. They secreted chemicals with antibiotic properties to inhibit mold growth, and devised fertilization protocols using manure. 16. 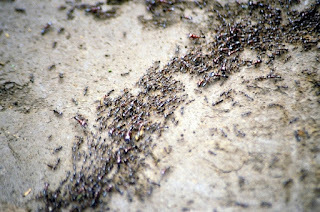 The largest ant colony ever found is 6000 km or 3750 miles wide. A giant colony of invasive Argentinian ants stretching 6000 Km or 3750 miles has been discovered in Europe posing a major threat to local animals and crops. Although they exist in their usual smaller group size in their homeland, the colonies have merged to create one massive super colony. 17. Fire ants cause an estimated $5 billion worth of damage to North America per year. 18. Mostly all ants are female. Nearly all the ants you see in the wild are female. Males ants, or drones, don't do any work in the colony, they don't look like ants, and only live for a few months during the nuptial flight seasons. Their one job is to fertilize queen ant, after which they die. 19. Recently 'all female' leaf cutter ant species have been discovered, they reproduce by cloning themselves! 20. Some ants have no eyes. Most ants have very poor eyesight. Some species have developed such advanced communication through use of their antennae, that they have no need for eyes at all. This major worker from the Driver ant species is a prime example of a 'blind' ant.